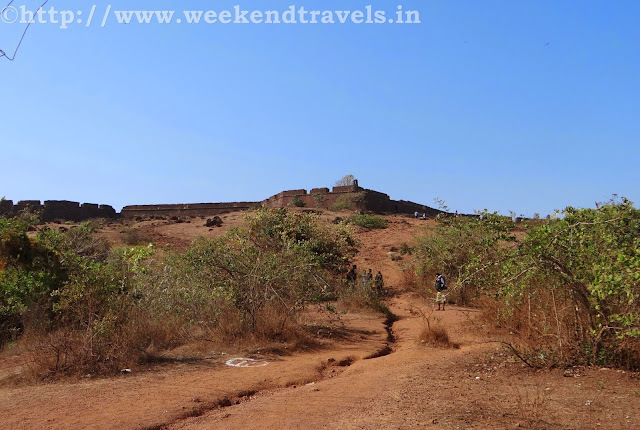 The Chapora Fort occupies an important position which, in every direction commanded distant approaches. Rising above the wide Chapora River, long before the Portuguese arrived in Goa, was a fort in place of the present one built. Even after the Portuguese acquired Bardez, the fort changed hands several times and was much sought after. Trying to end the Portuguese rule in Goa, Prince Akbar joined his father’s enemies, the Marathas in 1683 and made this place his base camp and it became the northern outpost of the Old conquests. 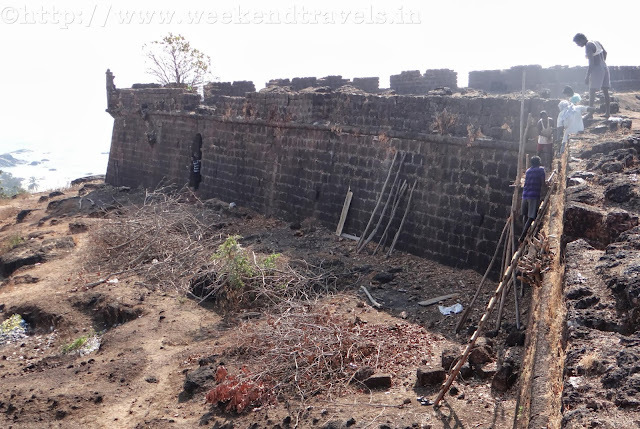 After the Portuguese recovered from a scary experience with the Marathas they learnt that they had to strengthen their northern defenses and provide shelter to the people there, but not until 1717 this present fort was built. The brilliant site has steep slopes on all sides. The fort follows the outline of higher slopes, stands above the whole upland area having an irregular outer plan and uses the natural form to add defensive height to the fullest advantage instead of dry ditches being dug. At the top of the steep approach track, the main gate is small and unpretentious for such a large fort but narrow and deep. Depending on defense requirements, the positions of bastions each having the cylindrical turret that gives a special character are irregularly spaced with their enormous embrasures for cannon. The church that was dedicated to St. Anthony has disappeared and inside only a few signs of the barracks and housing that once filled this vast area are left. Now in a wide expanse of open space there is only a tumble of stones with a few herds of goats and cashew bushes. A natural valley to the beach protected by rocky promontories provides an excellent natural access to the sea. Across the Chapora river, the Hindu ruler of Pernem, the Maharaja of Sawantwadi who was an old enemy of the Portuguese held the fort for 2 years after it fell to the Marathas in 1739 in its first test. When Goa's border moved northwards with the acquisition of Pernem as part of the New Conquests, the fort lost its military significance towards the end of the century. It is a pleasant place to wander that offers fantastic views north across the Chapora river to Pernem, south over Vagator and also far out to the Arabian Sea in the West. This is the fort where shooting of famous Film Dil Chahta hai was done. No place to stay on the Fort. Once can stay in Chapora.